Today, most towns and cities require a fire lane to be marked in any commercial or multifamily parking lot. This service is different from typical parking lot line painting and requires special equipment and skill because of the regulations and requirements that go along with a fire lane. When you need fire lane painting in Waco and Temple, TX, call the experts with experience in city ordinances and requirements. Call the eSquared Asphalt Maintenance experts at 254-716-8685 to schedule your appointment now. One of the main things that make fire lanes different is the fact that it is required to follow the curb or parking lot ending completely. They are also required to be placed on the vertical area of the curb. This step requires extra skill to create a uniform, smooth line. Much like handicap requirements, city ordinances provide specific specifications on the width, height, and turnaround area of your fire lane. They also regulate the height, width and spacing of the letters applied to the lane. Our professionals are up to date and knowledgeable on local ordinances to ensure your fire lane is painted correctly and accurately with all codes and regulations in mind. For fire lane painting in Waco and Temple, TX, call us today! With fire code and building violations, can come hefty fines, punishments, and other consequences. Don’t take chances with your fire lanes. Our professionals research each local specifications to ensure a perfectly structured paint job that meets all of your city’s requirements so you don’t have to worry. 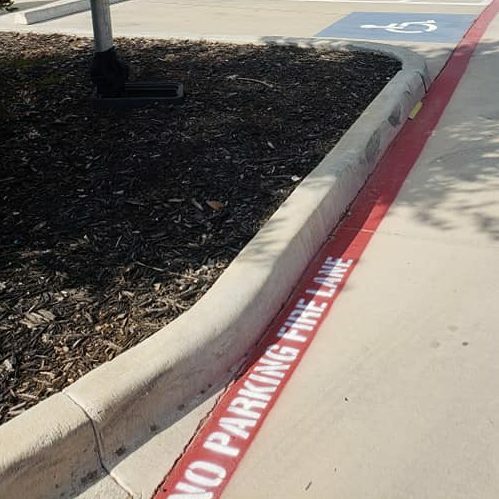 Our team has the specialized equipment needed to create straight, even verticle lines on your curbs, and can complete your fire lane painting project in Waco and Temple, TX with minimal interruption to your business. We use high-quality paint and materials to ensure that your lines can withstand traffic, weather, and even water flow to help your lanes last longer and stay brighter. When your parking lot needs new fire lane painting in Waco and Temple, TX, call our experts for a complete, uniform job that stands up to the elements and resists peeling and fading. Call 254-716-8685 to speak with a painting professional and schedule your fire lane project. Updated on March 21, 2019 at 1:42 pm by eSquared Asphalt Maintenance.